Have you heard the latest Duggar news? 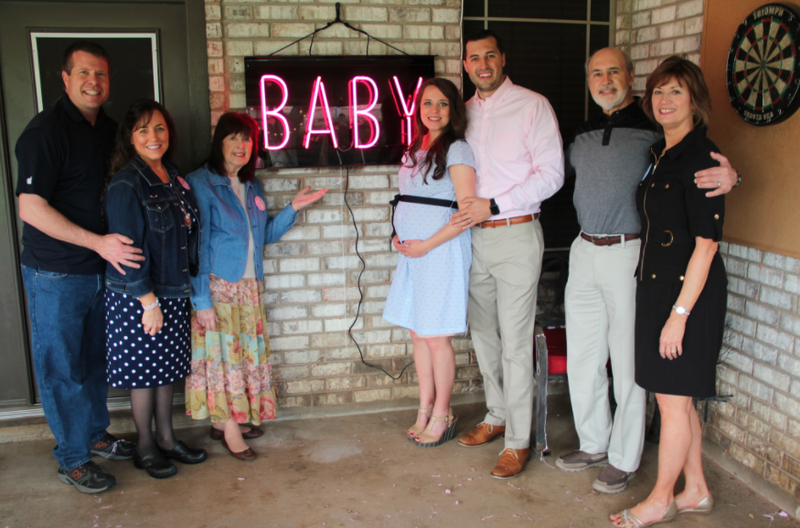 Jinger and Jeremy Vuolo are having a baby girl! They announced the news to family and friends (Jinger's family traveled down from Arkansas) during a gender reveal party at their home in Laredo, Texas. The guests went through an obstacle course, which ended with a neon sign. When the course was completed, the sign was lit up in pink. Friends of Jinger and Jeremy also surprised them with a shower for their daughter. Photos courtesy DCL; for more photos from the gender reveal party, visit the TLC website. Oh no, not the belly hold. I thought Jinger was better than that. What do you mean “better than that”? Where do you want her hands to be, on her head? Literally all moms take pictures showing how far along they are, no need to be critical. I know. I was disappointed by that too. Where do you suggest she put her arms? Really, just because you don't like the belly hold doesn't mean some of us dont! There are a bunch of instances where it’s very appropriate to hold your belly. Got to draw everyone's attention there and make sure they see how big. Mary Bullard, you are wrong. I've had two children, and I never did the belly hold! Look at old photos of pregnant women. The "belly hold" was probably started by Demi Moore on the cover of Vanity Fair and has only intensified in the Instagram/selfie age. Not exactly modest. It never occurred to me to hold my pregnant belly. I know, 9:19. The last thing I wanted to do was draw attention to how big I was or make my tummy look bigger. It was nobody's business how big my body was getting! I always held my belly as a part of being a mother who loved her children. I also talked to them. Encouraged my husband to sing to them and talk to them. We also put our hands on my belly and prayed for them. This proved a big blessing when I had a tubal pregnancy. The hospital was insistent that I needed an abortion (DNC) but The Lord spoke to me and said, "You didn't ask me to move that baby. " I told my husband what The Lord said and we both prayed together and asked Him to move her to the right place, and within 24 hours, He did. I saw the ultrasound pictures showing her in the tube before we prayed. And she was already way bigger than the tube. Now, she is a precious 18 year old blessing! So, enough of this disconnect from the precious blessings in our womb, ladies! Let's touch them, talk to them, hold them as much as possible, sing to them, and pray for them! They need to be loved,appreciated, and celebrated from the very beginning! Lord, please help us when the world has such disconnected, unappreciative, controlling, and rude women! The guests had to go through an obstacle course? Was this a gender reveal party or a fraternity initiation? Frats do not have obstacle courses for initiation. Oh, please. 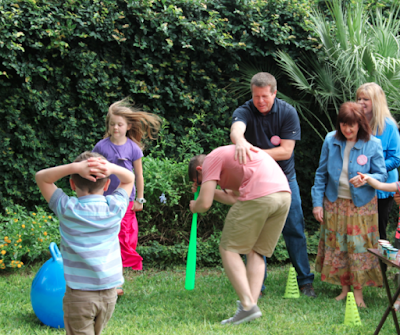 It's just a way to have fun with the reveal and get the whole family involved. Most frat initiations would be much more interested in alcohol rather than a kiddy obstacle course lol. Btw, this is 2018 not 1970. Its a party. You do fun stuff at parties. Like going through obstacle courses. If this is how the family chooses to reveal the gender of their babies, why does it bother you; please keep negative comments to yourself, we don’t want to see them on this site! Ha ha ha 12:20! That's one we haven't seen yet! You watch....it'll come!! And then you'll have the credit for giving them that idea! This was a unique way to reveal the gender. I’m still in favor of finding out at the birth, but each to their own. Jinger and Jeremy are both beaming with joy, can’t wait to learn what they name her. I'm in favor of calling your parents and then letting the news get around naturally. Used to be when the doctor held up the baby, that's when you found out if it was a boy or a girl. Dad called a few people and had a cigar, and that was that. No neon involved. Custom neon signs are pricey. So what. They didn't ask you for money to pay for it, did they? If you do proper strength training you can really strengthen all the muscles that support your knees and avoid such problems. Just can't be afraid to lift heavy....no most women do not produce the testosterone to "bulk up"
I’m 73 years old and I wore heels since I was 14 years old. I still wear them to very nice events. No knee problems, no hip problems, no back problems, no side effects at all. You don’t have to wear sandals, flip flops flats, tennis shoes or go barefooted when you’re pregnant. Chill! Moderation!! Why so much NEGATIVITY ??? I am just starting to consider wearing more flat shoes. Unfortunately I have a foot problem and heels certainly don't help. I found out that even without heels I can look professional and feminine. S. from Holland. This is actually true. My grandmother tried to warn me when I was in my 20’s (of course I didn’t listen) now, I have poor circulation in my legs, feet and toes! Agree. Heels position the foot and body in totally unnatural ways. Not so different from the practice of foot-binding! 1:43 -- You're right about women wearing heels nonstop to work. I did that for at least 10 years to work every day and wish I hadn't. But wearing heels to church and on for special occasions now and then should be okay. Heels do awful things to your metatarsal foot region! You mess up that area from wearing high heels, and there is no going back. Actually, the only shoe I put on my feet in the morning and when I come home from work at night are my heels. I believe I have a condition called plantar fasciitis and it so painful. It raises the heel of my foot because I have a high arch and it becomes inflamed and so swollen from the concrete floors I am on all day (retail mgr). So, to each their own but I am thankful for heels. What is Jim Bob doing to Ben? He's helping spin him around. I see Jeremy is taking a page out of Jim bobs book on holding onto your wife like she might run away. He should look to his own parents for a good example on how to stand in a family picture, his Dad has his arm around his Mom in a relaxed but loving way. Is there anything people won’t complain about? They’re standing like that to show her stomach, they’ve taken plenty of pictures in normal standing positions. That’s his choice, he loves his wife! Please stop the criticism! Anonymous 1:10 - No, the haters will complain about everything. Plus, we should probably ignore them but comments like this are so ridiculous it's hard to. I enjoyed seeing GMA Mary too, and Jim Bobs sister! Yay! First girl in the family!! Errrr... what about Anna's daughters? Joshua and Anna Duggar have 2 girls. We don't see or hear anything from them. And this is the first girl from a Duggar sisther so it is special. Don't forget McKenzie and Merideth. Josh is a duggar just as much as Jinger is. McKenzie and Merideth are part of the Duggar family too! Therefore, they are granddaughters just as Jinger's daughter will be. Just because McKenzie and Merideth are not on the show does not mean they are not real granddaughters. McKenzie IS the first grandaughter. How creative and Fun way to reveal the baby's gender! So thrilled it's a girl! Doesn't this family realize that the 'baby cradling" profile photos are not modest. We don't need to see how Jinger's abdomen is growing. No Bueno. Why is Jeremy adopting the 'holding the wife's arm behind her" photo pose? Can't she stand on her own?Diana Vuolo, once again, looks fabulous. Great dress. The other ladies should take note of that. Speak for yourself! Most of us that come to this website of Ellie's are really long time Duggar fans who certainly enjoy seeing pregnancy update pics along with any and all other pics of all Duggar's and their families! Si Bueno!👌 PS, next time just say " congrats Jeremy and jinger! ", life's nicer that way. You really need to think before you post. The majority of that comment was far from kind and very unneeded. Why critique how someone else stands and where they put their arms around their own spouse? It is just unnecessary! Why can’t we just allow that everyone is different? The Duggars obviously think the profile photos are modest or they'd stop doing it. In the grand scheme of things, who cares? If you don’t have something nice to say, please stay off of the Duggar’s blog; that’s rude!! I hope that sign is rented. I can't imagine buying a neon sign for a one-time gender reveal. Really? I thought they were going to just leave it up. Or they can keep in the Duggar "warehouse" and then whoever has the next girl can use it. I doubt they bought it to keep it. It may not be a one time, besides, what do you care, it’s not your money! It is a bit much, 4:10, for one reveal moment. Maybe they bought it at a discount. Maybe Jinger will re-sell it later. It's not like they put a marquee on their rooftop. 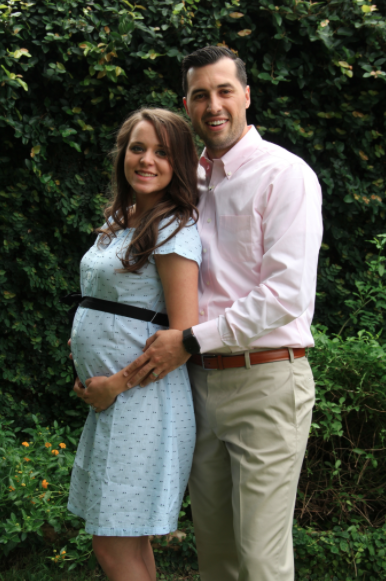 I see Jinger has the Duggar belly hold down pat. It’s not a Duggar belly hold, almost all expectant moms take pictures like that. It's not a Duggar thing. I've seen almost every pregnant woman I know do this! You mean the "pregnant mom belly hold," don't you? It's certainly not unique to the Duggars. @4:10, Have you had children of your own? If not you will likely be taking a picture holding your belly at some point in your pregnancy. I know I did with my first child,13 years ago. It's a proud momma moment! Nothing to be ashamed of. No, not everyone does the belly hold. I don't know anyone who ever did it. And when you get to be middle-aged, you can do the belly hold again, without being pregnant! It's a miracle. Congratulations Jinger and Jeremy! It's time for a girl! Here's a question for the family - Why is Tyler not on your picture header for your family blog? He is Michelle and Jim Bob's adopted son, right? No he has not been adopted, Michelle and JB are his guardians. I don’t think they have full rights over him, and even if they do, they’re probably giving him more privacy. No, he is not adopted, so that is why. They are his legal guardians not adoptive parents and they have asked for respect for his privacy. They have guardianship over Tyler. There may be some legality over posting his photo permantly on the site. Not saying that is the case, but it could be. Not adopted. They have temporary guardianship. You are right, it would be wonderfull to havea picture of Tyler there as well. S. from Holland. Not adopted, the Duggars have custody, guardanship. He is still the child of his mother. In time, his mother could get her act together and regain custody and Tyler could, when he is 14, asked to live with his mom. No, Tyler has not been adopted by them. It is a guardianship not an adoption. The hope is that Tyler will one day be able to return to his mom. So no. Not an adopted son. 8:34, that’s my sisters name! I hope they choose a beautiful italian name to go with their surname and the Vuolos heritage, Sophia or Francesca would be lovely. 8:34, How do you know? Aww so sweet the family & Friends did a baby shower for Jing & Jere. They sure do things on a grand scale. Family members coming from different states. Money is no problem obviously. Money, money, money. You commentators do nothing but gripe, gripe, gripe. Just because family makes a point to come to get togethers, doesn’t mean it was expensive nor does it mean they misuse money or are leaches. This family is loving, kind, considerate and do for each other. So CHILL!!!! Some Americans waist money on alcohol and some spend it on better things like this family does!!! They love their family, I would do the same thing if I could afford it. God bless them. If the event was filmed for Counting On perhaps some of the costs were covered or are tax deductible.....I know my finances are private let’s not question theirs. My finances are private but so is my life. I wouldn't dream of dating, giving birth, or airing my wedding on television. This family is not "private" in any sense of the word. Even the Duggars are entitled to privacy and only have to share what they choose. Sounds like they had a fun time! I'm happy to hear they're having a girl. Can't wait to hear what her name is. Yeay! I was hoping for a girl since everyone else was having boys. :-) Congrats to the family! Anna has 2 daughters. They are cousins. The only ones with the Duggar name, actually. I'm sure Josh and Anna's girls will be excited to finally have a girl cousin! Don't forget McKenzie and Merideth. They are not part of the show. And the sisthers deen really close. So it is different. wow. This whole thread is either about the belly hold or how Jeremy is holding onto Jinger. who cares. Congratulations again on Baby girl Vuolo! To all the critics, how do you think pregnant women should dress and stand? Wear a muumuu or caftan and hide her belly as much as she can? Or maybe be confined at home like they did in the Victorian age? Jinger's dress here is not skintight or short. So merely holding a baby bump is immodest now? Even when the pic was taken at a special event focused on the baby. I doubt she poses like that all the time. People criticize her for drawing attention to her belly, but a pregnant belly kinda does that all on its own anyway. @ 4:25 You don't need to press your hands under your pregnant abdomen, though, to show exactly how big your body is. We hold no other parts of our bodies to show off their size. That would not be socially acceptable. So happy for them! Not sure why others feel the need to push their opinions when they aren't asked for. Insulting her Heels? Seriously? Most of us wear them and are still fine as we age.I'm 50 and have worn them 6 days a week for at least 30 years without issues. Anyways, super happy a baby girl is on the way! It seemed like advice more than an opinion. Heels put the body in unnatural posture, put too pressure on the toes and ball of the feet. Every woman I knew, by her late 50s have some kind of problem, either with their backs, their knees, their ankles of their feet. Some have had to have procedures done on their feet. So, no it is not just an opinion but friendly well meaning advice. And it is a medical fact, there is no disputing that.I suggest you do some research. I gave up on vanity years ago and wear only shoes I can walk in comfortably for long distances. My back and my feet, my hips and ankles are in good condition and I am near 70, unlike so many other females of my age. @7:45. Tyler is not an adopted son but Michelle and Jim Bob's nephew on Michelle's side....but I think you made a valid point....Tyler should be included. Diana Vuolo is very attractive. Congrats on the girl everyone. Love Jinger's classy and sophisticate maternity wardrobe! Never frumpy. I agree! And really modest too, not tight. agree, that dress is adorable. Why does Michelle always wear black hose? Is her legs particularly bad with veins that she won't be in public without something dark on her legs? Pants would solve that problem and be much cooler and more comfortable. Does it really matter or affect your life in any way? If so, hope she knows there are things she can do to get rid of the veins. Her shoes are really different. Anon @ 8;49, In the UK we would refer to shoes like Michelles as clod hoppers. She has problems with her feet. It was just a question 2:20. Calm down. All I've seen on some of these posts is critics being critical of the critics. There in the same boat. Be uplifting and positive. All I saw and read was a question not criticism. We all probably have had that question cross our minds before. I'm pretty sure its all for the benefit of the show. If there was no show I don't think they would go tbrough all this 'plavar'! Why can’t they have fun? Why do you care? They can do what they choose too just like you can make your own choices. Obviously they are being filmed for next season. Why not make things a party and make it enjoyable for the little kids as well as the adults? Anon @ 12:14 I'm in the UK where we used this word quite a lot, its one of my favourites, does it get used in the US much? And why can't they have some fun with the announcement? Wow, people, whoever put a negative comment on here better check their heart for jealousy, because sorry, there is just no good reason to be negative about this post. What is there to be jealous about? It might not be jealousy, it might just be that tendency of people to put down others to make themselves feel better. Everyone does the belly hold. Celebrities, regular people, everyone!! Jennifer, who are you referring too? Jennifer, who are you talking about? Hmmmm?? Never did it, huh?? So?? Jeremy's mom looks so classy in that outfit. I love that dress and really love her sandals. She is a lovely lady! I can see Jinger's baby being dressed so stylish. Grandma Mary, I love your skirt! Nice family time, a little much for me for my taste. Jinger looms great! Don't girls believe in wearing slips under their dresses these days? No, we really don’t. You must have been born before the 1950s. And how is holding her belly not being modest? And why does some ppl got to be hateful over their choice on how to do THEIR reveal party?? Some ppl are are just miserable with their own lives and wish others were just as miserable as they are.